Swansea City head coach Garry Monk says fellow fledgling boss Ryan Giggs has the experience to succeed at Manchester United but must be true to himself. Giggs has been put in temporary charge of United after David Moyes' sacking. Monk knows what is in store for the Wales great, having taken the Swansea reins when Michael Laudrup departed at the start of February. "Ryan... there's pretty much nothing that he doesn't know about football," Monk said. "People will still push on the fact that he's lacking experience in management terms, but it's the same situation. "He just has to go in there and be himself and use the experience that he has got to put onto the players, and I'm sure you'll see a reaction from all their players - it tends to happen in these situations." Swansea seem set for another season in the Premier League after their 2-1 win at Newcastle last weekend, although they are not mathematically safe yet. Giggs, meanwhile, will take charge of the Red Devils for the first time on Saturday when they face Norwich City at Old Trafford. 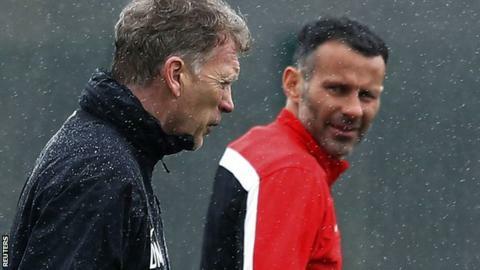 While Monk says he has enjoyed his step up from the ranks, he warned that Giggs will have to modify his relationship with the rest of the squad. "The dynamic has to change. You can't pretend to be someone else, that simply won't work," Monk added. "But you've now got the decision where certain players will be playing and certain players won't... and going from being their friend to having to tell them they're not in the squad this week, they're the fundamentals. "I guess you accept that when you take on the job. "It's not easy, as I found out. You have all these things you think will go like this, this and this but things crop up along the way that you didn't expect. "There's other things that you're learning and the whole other side of it: the planning, preparation and paperwork and things like that. "You don't tend to think about that as a player. I kind of knew it because that's the way I'd been thinking, and Ryan has been doing his coaching badges along the way, so he would have seen that side of it. "But any coaching badge doesn't prepare you for this sort of job, you have to learn on the go. That's something I've been doing and I'm sure Ryan will do the same." Swansea host Aston Villa at the Liberty Stadium on Saturday looking for the win that will ensure their survival beyond doubt and allow the Welsh club to start planning for next season.